The regular use of debit and credit cards has become universally accepted by Americans. It is how we buy and sell in the USA; it is our custom now, part of the American Way. And whether we admit it or not, habits are extremely difficult to stop. We are an accumulation of habits; we are set in our ways. This makes world travel complicated. Then why have I needed to loan money to Americans traveling abroad? 1. They do not know how to use an ATM machine. 2. They did not bring any U.S. dollars. 3. They believe the advertisements about travelers’ checks, which are quickly becoming obsolete (except in Europe). This means that they have not been introduced to the real world, the world that does not protect Americans. I am willing to guess that 1 in 5 Americans does not carry cash, and 1 in 50 probably have never used an ATM bank cash machine. 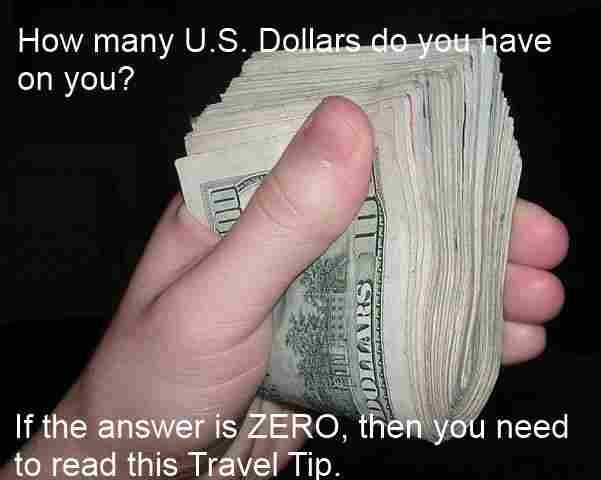 How many U.S. dollars should you carry on you? Answer: five times the price of one night in the hotel or your choice. That way, you have five days with a place to stay to recover from almost any money problem. And learn how Western Union works, so you can bypass “banks are closed because of the weekend” problems. And you do realize that Europe is 5-8 hours ahead of the USA in different in time zone? Andy Graham … normally on the other side of the planet from you. Credit cards are still big for American travelers. Many think they are useable anywhere which is not always true. I don't know about Africa or a few other countries but debit cards are generally the most convenient and safest way to have money available, at least in cities with large banks. Europe and Asia they are quite convenient to use. I take as many dollars as I consider necessary and I make certain I have my debit card well backed up at home. What many travelers do not do is the research needed prior to a trip to know what is readily available and what is not in terms of money. ATMs, banks, exchanges, etc. Also they should only use bank ATMs as many non bank may be either phonies or charge an exorbitant use fee. They should also check with their debit card provider if their card can be used outside of the US. Research is so easy now yet so many do not do it. Oh well, their loss. In China my card was never charged a usage fee at any of the large bank systems even in small towns so I never had a cash problem. I only use ATMs that are in "large" banks. There are stories about fake ATMs and a ATMs with card readers attached to steal passwords. Use fees and exchange charges are up to individual banks - the ATM bank and your home bank. There's another reason to carry cash. If you are going to a country with a rip-off exchange rate, like Argentina, using your debit card to withdraw cash will cost you. Instead, take cash and exchange it on the "blue" market you will get 8 ARS to the USD (that was the rate last time I checked). So if you're flying to Buenos Aires, take as much in cash as you expect to spend while you're there. (There is no requirement to report amounts less than ten thousand dollars American.) And do some research beforehand to find a "cueva" where you can exchange your money. Addendum: I forgot to say the official rate is only a little over 5 ARS to the dollar, which is what you get at an ATM. Mark, there are processing companies, normally Cirrus, and Plus, and other names on the back of cards. You can carry 2 card, but still be denied if the system is down. Schwab is good, I think they refund you cost of using ATM's. I use 2 debit cards, with separate cirrus and plus on the back, plus have my account connected online to Western Union, and I could wire money to someone quickly if I was robbed, then cancel the 2 cards. In the end, the customer service I want it this, say my two cards got robbed? I want to have the person at Schwab send me a new card to wherever I am in Africa, etc. I have a friend, at the local bank in Fort Wayne, and if really needed, she could get the card Fed Ex, to me, still take 3 days, not overnight. But, the time it takes to process, and get a new card would be solved. I would have about 500 USD already on me. I would send probably 1000-2000 USD to someone, I do not think I can send to myself. "I used to use my fathers ATM, connected to Western Union, and sent myself 1000 dollar in Ivory Coast, when the local machine would not give me more than 125 dollars per day, I was not sure there was ATM's in Ghana, this was 8 years ago. I would go sit in the cheapest hotel possible, never move until the card came. My mother sent me a new ATM card, she put it inside a book, and sent to Hotel in Ermita, Manila, Philippines." Where to send the card, is also a problem. We can hope we have a friend that will loan us money. Generally though, if you totally screw up, backpacker Hotels will let you live for up to 30 days free, without cash. But, the expensive hotels will probably not. When a 5 star Hotel person loses their cards, they can have problems. They need to carry at least 5 days cash, and really up to 15 days cash to pay the Hotel. The debit cards are from different banks, safer.